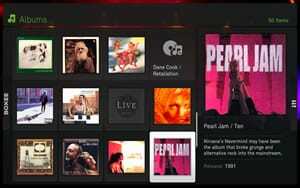 Check out Boxee – the Linux/Mac media center that’s better than sliced bread! Every so often I run across a piece of software that makes me feel like I’m getting an early birthday present. Boxee felt like a birthday present AND a Christmas present all at once! I have tested a lot of media center software, but Boxee is easily the best I’ve ever seen. If you have an Intel Mac or Linux it’s a must have. Best of all, it can all be controlled through your remote! and best of all… NetFlix!!! That’s right! You can hook into your Netflix account and stream them though Boxee. The interface design is top notch and easy to navigate. You can also add movies to your streaming queue within Boxee. With those selections you can easily get anything you want! Boxee supports all major photo files and has a very clean and easy to use viewer for your photos. If you want to hook into other photo services then you can view them from Flickr, Picasa and The Big Picture. Pretty nice way to round out an already amazing program. One of the most unique parts of Boxee is the fact that it’s a social media player, meaning that you can see what your friends have been watching and you can join in. For example, when I first logged in it said that one of my friends recently watched Pitch Black. I clicked on the icon of Pitch Black and it went into Hulu, found the movie, then started to stream it. If it can’t find it then it pulls up the description from IMDB. There are a lot of other great things in Boxee, but I think this is a pretty good overview. If you are looking for a great media player then Boxee is it. I just hook up my MacBook Pro to my TV, grab my apple remote and relax for the evening. If you have an Apple TV then you can install Boxee on it for a total media experience. Boxee is still in a closed alpha state. It does, however, allow you to add friends. Any friend of ‘corePHP’ is a friend of mine! Just register on ‘corePHP’ and request to be added and you can enjoy Boxee as well. It is currently out for Linux and OSX, but a PC version will be out very soon. It’s not too often that I find something this exciting that’s free! This entry was posted in Recommended Software on January 11, 2009 by The Core Team.